Please refer to our stock # 1-0516 when inquiring. 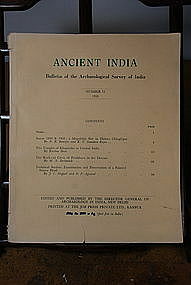 "Ancient India", Bulletin of the Archeological Survey of India, number 15, Year 1959. Edited and published by the Director General of Archaeology in India, New Delhi. Printed by the Job Press Ltd., Kanpur. 8 3/8"x10 11/16" (21,5x27 cm). 99 pages. Numerous drawings, maps and photos. A series of articles on the archeology of India, Afghanistan and Pakistan, by British and Indian field experts, published in the mid forties to the early sixties. Contents described on cover (see photo 1). Back slightly torn, worn but good condition inside.